"Sunbury Brewing Co. - Sunbury, PA"
Sunbury, Pennsylvania Comments: Now here is a very sharp, tough to find PA tray. The black and silver make this tray really stand out. The black also makes this tray tough to find in good shape. Black trays are notorious for show just about any scratches. 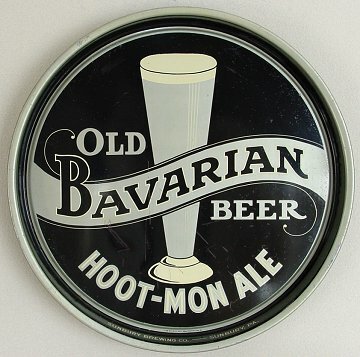 This one has a few which can be seen below the "A" in "Bavarian" and to the lower right of the glass. Very attractive tray.